While it is wonderful to have dense, voluminous hair that is soft and silky, we always struggle to keep the frizz under check and think why we lose so much hair every time we shampoo. More than using the right shampoo and brushing hair the right way, a lot goes wrong in the simple act of washing the hair. It is quite shocking how little we know about the right way of doing it in order to prevent hair fall and also boost its texture. By just correcting these few practices during and after washing our hair, we can avoid hair fall in a big way, and also have lush, long hair which is smooth and soft. It is actually that simple, you don’t need any fancy hair rituals and spas. You think by applying a greater quantity of shampoo you can actually get better hair texture, then you are widely mistaken. Both shampoo and conditioner should be used moderately, dilute them with water to work out a lather, but do not use excess of it. After a long day, all you want is a hot shower that will put you to sleep as soon as you hit the sack. It is blasphemous to put hot water to your head as it loosens the hair follicles making them fall off as you wash them. Settle for lukewarm to cool water for your hair, and you will notice how little hair you lose. Towel drying your hair may not be a very good idea after all. This is because the threads of the towel create friction with the newly washed hair that leads to frizziness and damage to the hair follicles. Use a plain cloth or blotting paper to just run it over the hair, but never rub. Are you in a habit of massaging your scalp and hair vigorously while shampooing? Stop doing it right away. Scrubbing hair for long thinking you are allowing the shampoo to work better can actually weaken your hair follicles and cause undue hair loss. Very gently massage your hair and then rinse off. Most of us get impatient by the time we get to the ritual of conditioning and wash off the hair soon after. You need to let the conditioner seep in for at least 5 minutes before you rinse off. Once you condition, with the tips of your fingers untangle the strands and straighten them, then see the results. You hair will be straight and smooth after the wash. 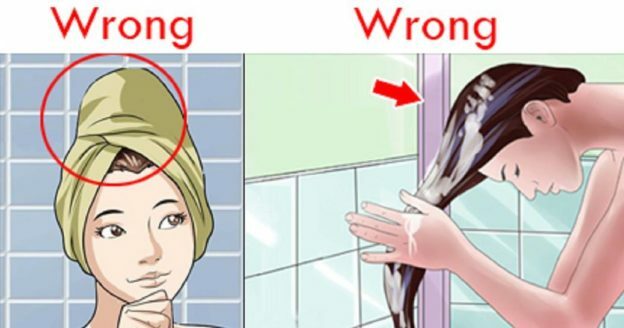 If you are one of those who believe in a round two of hair wash, you have been making a mistake all this time. By re-applying shampoo for better cleansing you are robbing your hair off its natural moisture. No wonder you complain of frizzy hair and hair fall. It makes your hair appear dull and changes its overall texture to rough and craggy. This is perhaps the most common practice to condition the hair as soon as you rinse off the shampoo. Your hair needs to be damp not wet when you apply a conditioner, otherwise the conditioner is not half as effective. It is a compulsion to shampoo your hair every time you decide to wash it. But by doing so you are ripping the hair off its natural moisture, outside of exposing it to unnecessary chemicals. Even simple water can do the trick, wash your hair with water and maybe apply a serum to keep the frizziness in check post that. While washing our hair in a rush we forget to cleanse the roots. It is where most of the problems aggregate. You need to massage the root well, and then go onward to the tip. This will work towards strengthening your hair follicles, and hence less hair fall.